So you thought you had to travel to Iceland to see puffins, eh? Well, think again! Not all wildlife encounters require you to hop on a plane. In fact, one of the best wildlife experiences I’ve ever had was right here in Blighty: Seeing puffins on Skomer Island. Skomer Island is a tiny, uninhabited island off the Pembrokeshire Coast in Wales. It’s less than 3 kilometres square, making it the perfect size for walkers, hikers and wildlife enthusiasts like me to spend a day out. 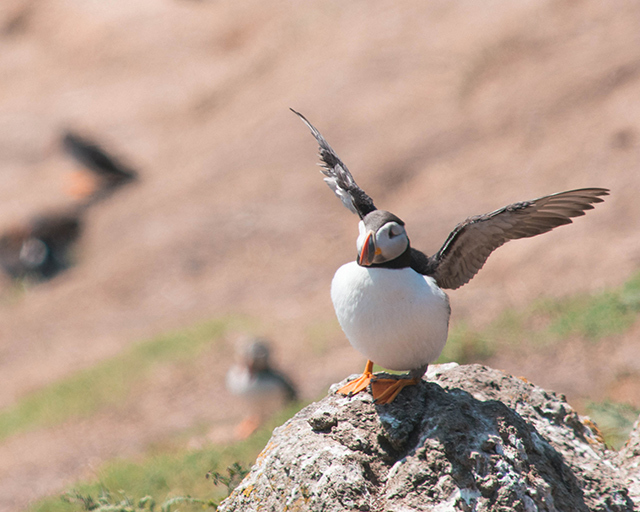 Falling under the remit of the Wildlife Trust for South and West Wales, the island is a protected habitat for many of the UK’s best loved species, including seals, seabirds and, of course, puffins. The Puffins on Skomer Island seemed to be posing for an album cover! Puffins are one of the most well-known bird species in the world, and they can be found all over Skomer Island. Their distinctive orange beaks and feet make them incredibly endearing creatures, even earning them the nicknames of ‘clown of the sea’ or ‘sea parrot’. Their bodies are perfectly suited to the sea – their short wings help them to ‘fly’ through the water in search of food, and their beaks help them catch multiple fish in one go. 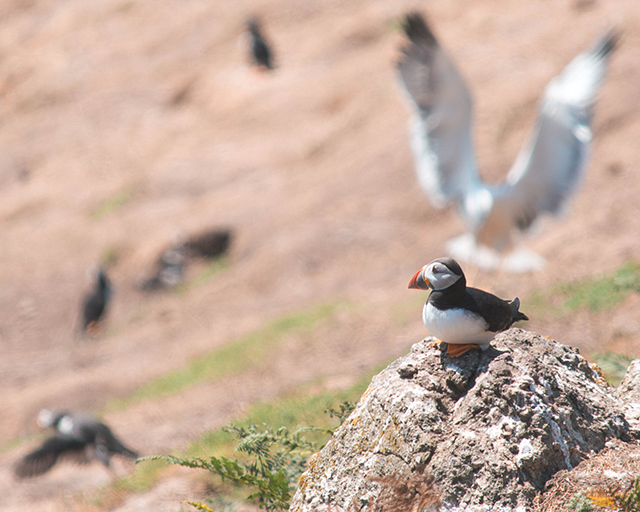 The puffins on Skomer Island are Atlantic Puffins – the same kind you find in Iceland and Norway. 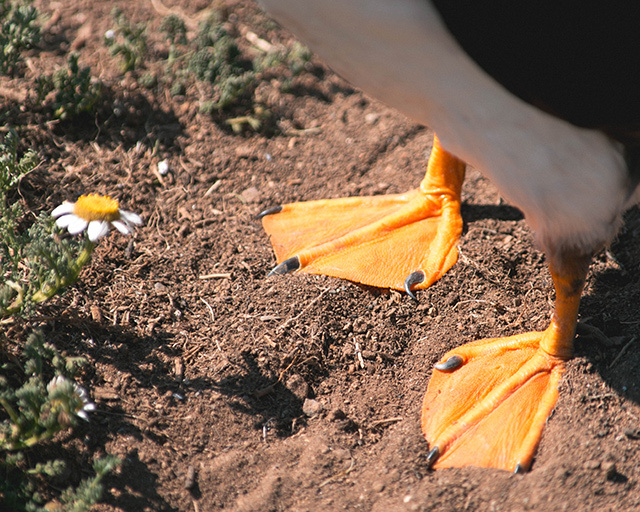 They’re a vulnerable species, but Skomer Island has recently been applauded for its successful conservation programme. While the rest of the world’s puffin population is in decline, the number of puffins seen on Skomer Island is actually increasing! Puffins spend the vast majority of their lives at sea, only returning to land to nest and feed their young. In fact, when youngsters first leave their nests, they stay at sea for 2 years before returning to land for the first time. If you want to see the Atlantic Puffins on Skomer Island, visit between April and July. 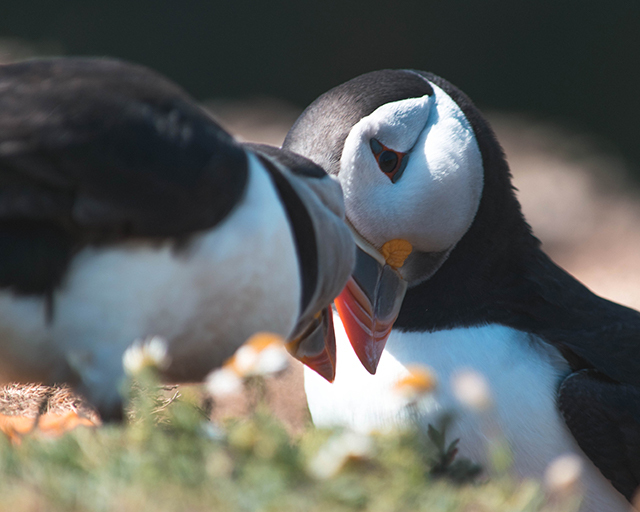 These beautiful creatures arrive on the island in early April ready to nest, and disappear again at the end of July when the pufflings no longer need parental support. After buying our landing passes at Lockley Lodge (more information later on in this post), we boarded our boat with 48 other passengers, all squashed up together on wooden benches. On the 15 minute boat journey to Skomer Island, we began spotting puffins flying out over the water and seals sunning themselves on the rocks. I desperately started snapping away with my camera, not realising that I really didn’t need to worry. The best sightings were yet to come. When we arrived at Skomer Island, we walked up a steep set of steps to meet the warden. He showed us a map of the site and set the ground rules for our visit – stick to the paths to avoid disturbing burrows, remember all animals on the island are wild and shouldn’t be disturbed, and to only sit down and eat at dedicated picnic sites dotted around the island. Then, we were free to explore. We started our visit by following the path from the landing point in the east towards the middle of the island. Reaching a crossroads, we took a left turn to walk clockwise around the island, knowing that the puffins tend to stick to the southern half of Skomer. It wasn’t long before we had our first sightings of puffins on Skomer Island! A huge number of puffins were flying around the coast, every now and then landing on the rocks. They were fascinating to watch – their small wings make them clumsy flyers, so they have to spread themselves out in order to land safely. We could have watched them for hours, but we remembered the warden’s advice to move on quickly so as not to disturb the birds and allow other visitors to get a look too. From here, we continued clockwise, admiring the incredibly clear, blue water that had decided to bless our visit in the middle of July. Every so often we would hear a puffin whizzing past overhead on their way back to their burrows in the Wick, their small wings flapping at huge speeds. The Wick is the most popular area for puffins and, therefore, visitors to the island. It’s a sheer sea cliff where the vast majority of puffin burrows are, due to its slightly sheltered position. The path here is roped off to remind visitors not to veer off course, but the puffins will happily waddle around your feet on their way back home. Being able to get so close to the puffins allowed for some very special sightings. We couldn’t believe our luck when this little fellow landed right in front of us with a beak full of sand eels, ready to feed its family. What incredible hunters they are! To find out more about these incredible creatures, I can highly recommend the RSPB Pocket Birds of Britain Book published by DK. It’s the perfect size to pop into your day bag, and bring out when you spot your favourite feathered friend. 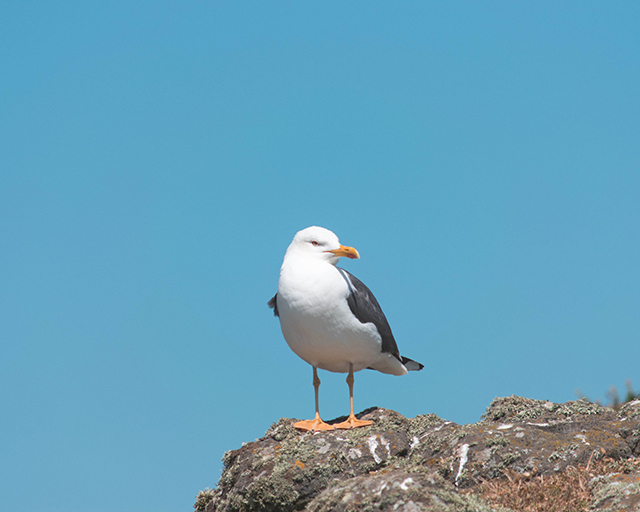 Though Skomer Island’s most famous residents might be its growing puffin population, there’s plenty of other wildlife to see too. In fact, the warden told us that Skomer Island is the most important island in the world for another very vulnerable seabird – the Manx Shearwater. Over half of the world’s population of the black and white birds nest at Skomer Island, but sadly only do so at night where they’re less likely to be troubled by seagulls. While we didn’t see any on our visit to Skomer, we were glad to be contributing to their conservation by visiting the island and Gift Aiding our entrance tickets. Another bird we did see a lot of, though, was the Kittiwake – more commonly known as the seagull. There were hundreds of these seabirds flying high above us on the island, but the puffins still managed to outnumber them by quite some margin. The seagulls seemed jealous of the attention the puffins were getting! In the north of the island, there’s an area called the Garland Stone, which is where the Grey Seals tend to hang out. When we visited, there weren’t that many around (we imagine it was too hot on the rocks for them to stay too long) but we eventually spotted a group of six near the water’s edge. They’re relatively difficult to see with the naked eye, but thanks to my telephoto lens and our binoculars we got quite a good view! It was fantastic to watch them from this distance, going about their business completely undisturbed: swimming, diving, and interacting with each other on the rocks. Seals are fascinating creatures! As our day trip to Skomer Island came to an end, we stood on the jetty waiting for our 3:30pm boat back to Martin’s Haven. We were watching hundreds of puffins bobbing about in the water, when we suddenly noticed a bloom of jellyfish (technical term!) floating alongside them. 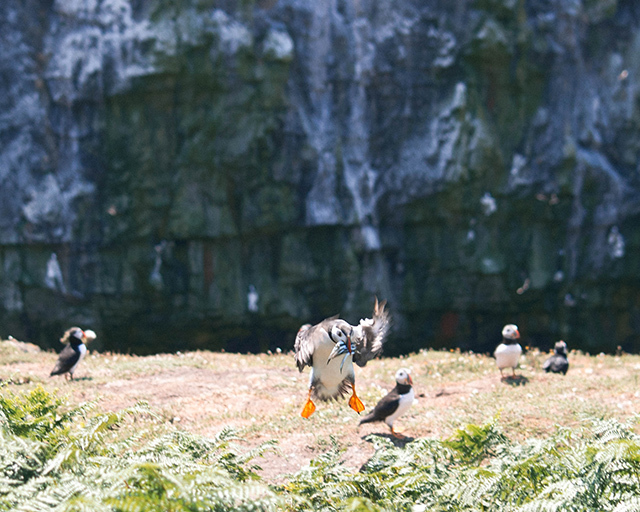 So even as you leave, Skomer Island will continue to surprise you! 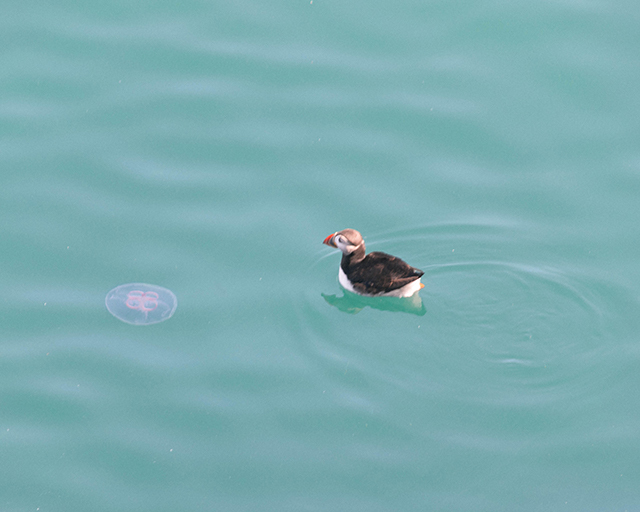 Who knew puffins and jellyfish would make such good friends? Skomer Island, being an island, is accessible by boat from Martin’s Haven. The boat can only sail in the right weather conditions, so do keep an eye on the weather before you decide to make a special trip. You can check to see if the boat is running by checking the boat’s dedicated Twitter feed, which is updated every morning. You can also call 01646 636800 to speak to the staff at Lockley Lodge too, as they’ll be able to give you accurate information. You’ll need to buy your landing pass from Lockley Lodge, which also sells souvenirs and last-minute snacks. Landing passes cost £11 each for adults, and they accept both cash and credit/debit cards. When buying your ticket, you’ll be allocated specific boat time for the outward and return journeys – don’t be late! The outward boat runs at 10am, 11am and 12pm, and returns at 3pm, 4pm and 5pm, but they often put on extra boats during the peak season. We took the 10:30am boat and returned at 3:30pm. You’ll need to pay the boatman as well for your boat ticket, which costs £11 each for adults and must be paid in cash in addition to the landing pass. Lockley Lodge officially opens at 8:30am, but can also open at 8am during the peak season. We didn’t know this, so we showed up at 8am on a Saturday morning expecting to be the first in the queue, only to find at least 50 people ahead of us! When visiting during the peak season, I recommend queuing up as an early as you can to guarantee your place – they often sell out of landing passes in the first couple of hours of opening. To reach Lockley Lodge, park at the National Trust Car Park in Martin’s Haven (postcode is SA62 3BJ). The car park costs £5 per car, but you’re given a ticket and welcome to come and go throughout the day. This is great if you’re allocated a later boat and want to head back to town to buy a more substantial picnic! 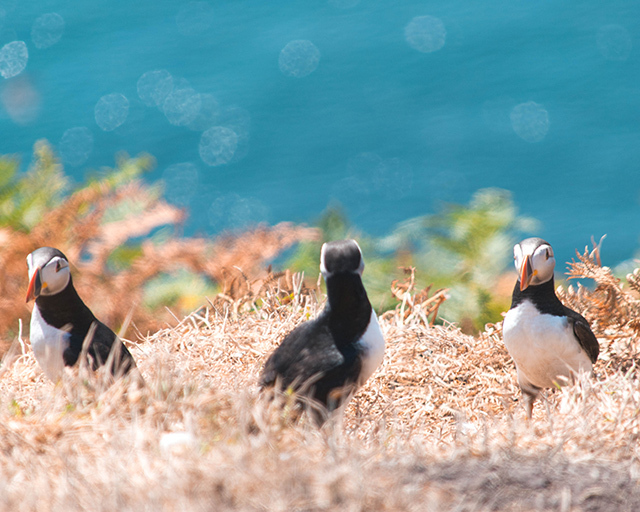 It is possible to stay overnight on Skomer Island if you book far enough in advance. Sleeping in Skomer Island’s self-catering accommodation gives guests a unique opportunity to watch the sunset behind the cliffs and see the Manx Shearwaters returning to their burrows after dark. 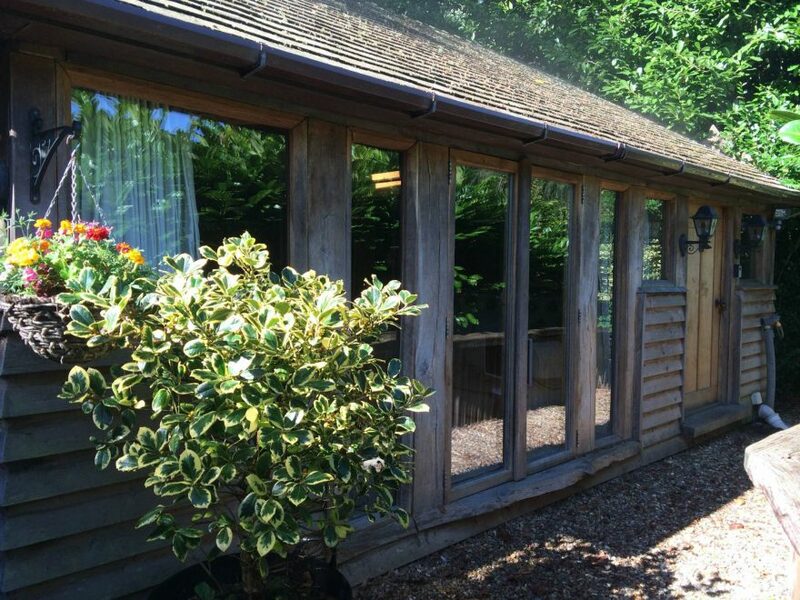 Otherwise, there are plenty of options for places to stay in Pembrokeshire, such as the eco-chic glampsite Top of the Woods. >> Read more about my stay at Top of the Woods here! 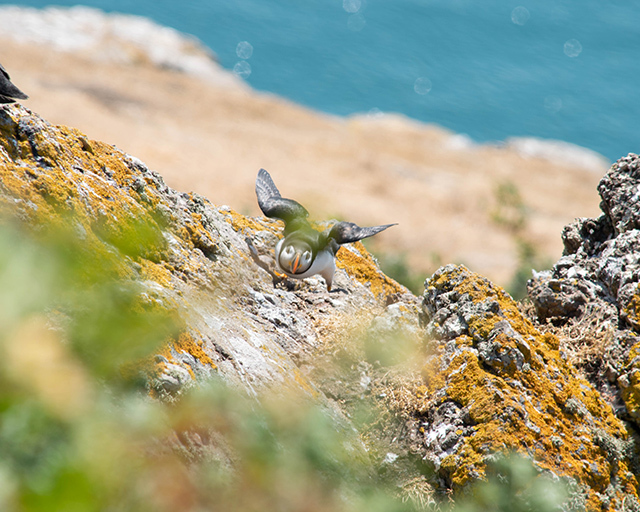 April – May: Skomer Island starts to come alive again in April and May. The first puffins will arrive on the island during April, and hundreds of seals will begin to moult ready for summer. Spring is also the time when bluebells bloom across the island. June – July: June and July make a great time to see puffins returning to their burrows with food for their pufflings. It’s also possible to see dolphins and porpoises in the waters around Skomer Island, so keep your eyes peeled! Puffins will prepare to leave the island at the end of July. August – September: Though the puffins may have left by now, August and September are the best months to see seals and their pups following the birthing season in late August. 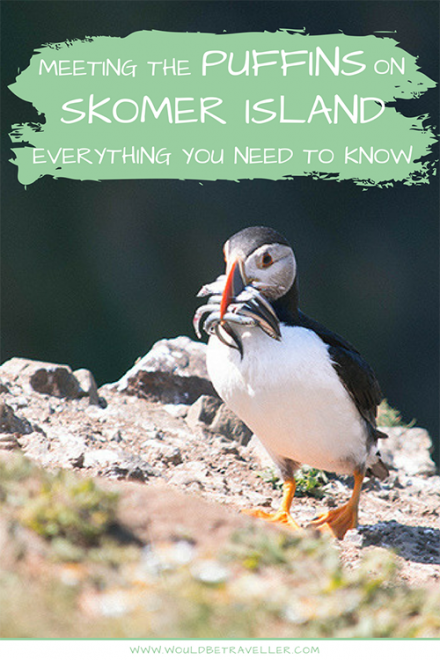 When visiting Skomer Island, you’ll need to take all the usual day trip essentials, such as snacks and your camera, but there are a few other essentials you might not have thought of. 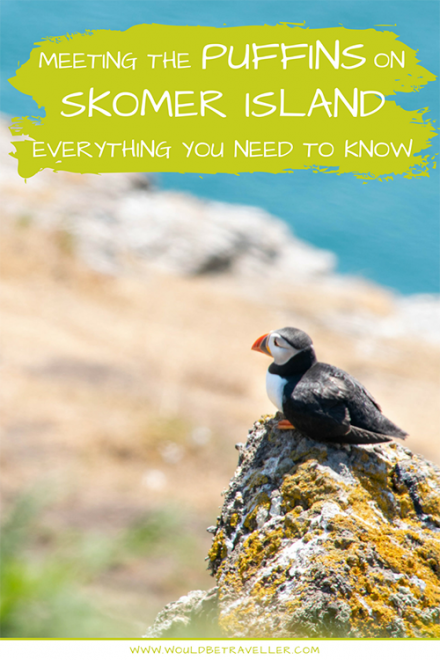 When visiting on hot, sunny days, remember there are no trees at all on Skomer Island. That means there’s barely any shade, so make sure you cover up with loose layers and wear suncream. Equally, if it’s cold or wet when you visit, you’ll need to wrap up warm and take a raincoat, just in case. It goes without saying that you’ll want to bring your camera with you, but make sure you pack a variety of lenses too. Even though the puffins on Skomer Island get close enough for you not to need a telephoto lens, being able to zoom in close is one of my favourite things to do in wildlife photography. Just look at the detail you can see in those feet! >> Brush up on your wildlife photography before you go by having a read of my top tips for wildlife photography here! 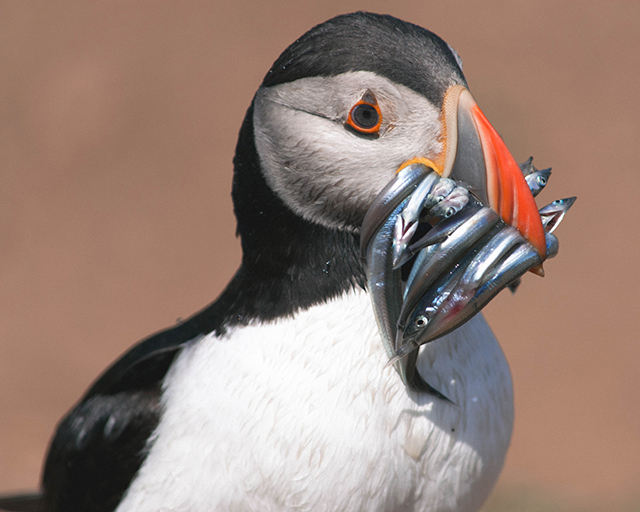 If you’ve got a good pair of binoculars, consider bringing them to Skomer Island too. 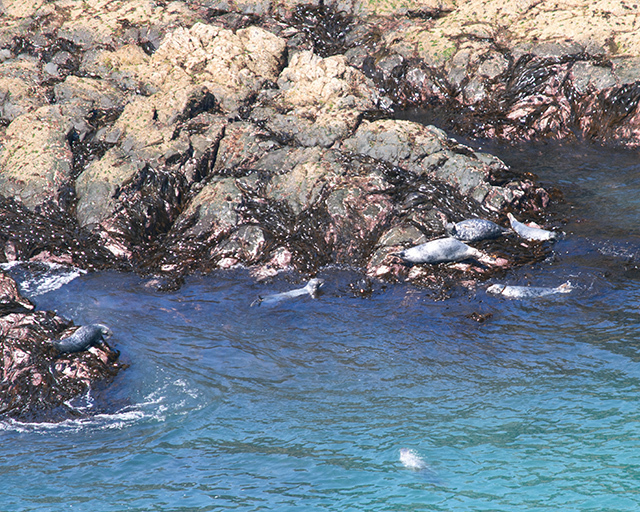 You can’t get too close to the seals, so binoculars will help you see them more clearly on the rocks. You can buy water from the Visitor’s Centre, but there’s no cafe facilities or shop, so you’ll need to bring your own picnic to keep you going for your whole visit. You’ll be on the island for a total of 5 hours, so make sure you have enough! 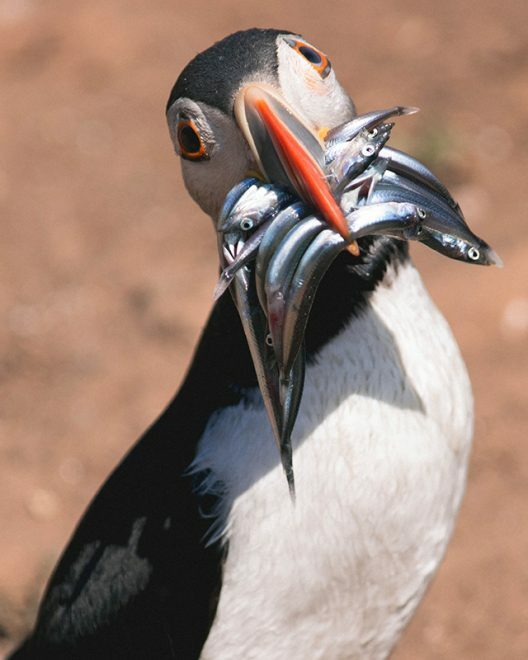 Please also remember that Skomer Island doesn’t have any bins, so you’ll need to take all of your rubbish back home with you. The compost toilets in the Visitor’s Centre do tend to have toilet paper and soap, but there’s no harm in taking some extra hand sanitiser and spare toilet paper. Remember that these are the only toilets on the island, so make sure you plan your visit appropriately and don’t get caught out miles from the facilities. Skomer Island is cared for by the Wildlife Trust of South and West Wales, so it’s an active wildlife sanctuary for seabirds and seals. That means you’ll need to follow a code of conduct, and listen to the advice of the wardens when you first arrive. They’ll tell you to stick to the paths so as to avoid treading on a rabbit or puffin burrow. When visiting The Wick, the puffins can walk across the footpaths in front of you. Make sure you stand behind the barriers and let the puffins come to you. They’re not afraid of humans, but that doesn’t mean they’ll enjoy you getting too close. It’s even a criminal offence to disturb them, so do look out! 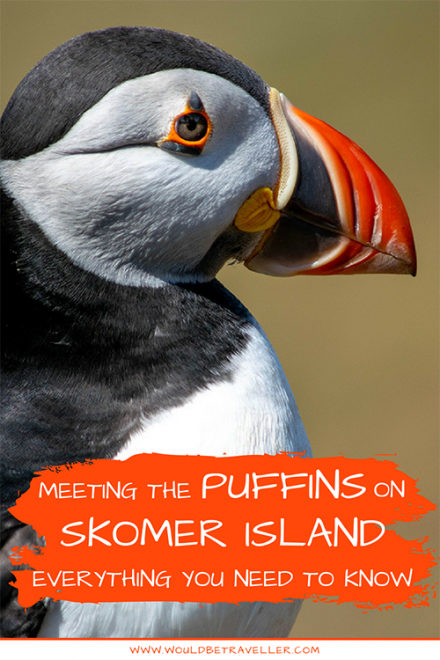 Are you planning a trip to meet the puffins on Skomer Island? Feel free to ask any questions in the comments – I’ll be happy to help! 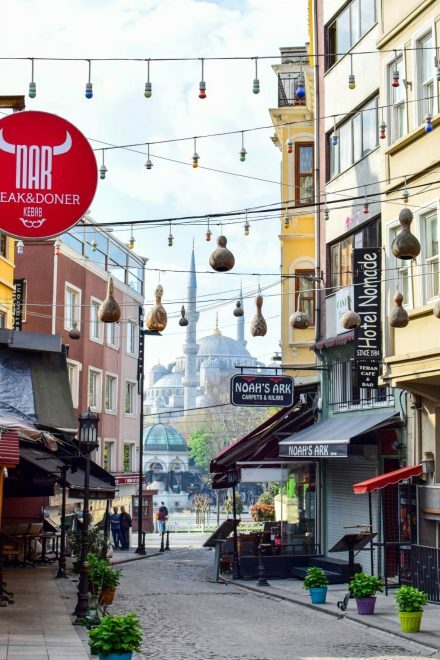 This post was written as an entry in to the Trips100/Audley Travel blogger challenge. Win an African safari with Audley Travel by sharing your best wildlife photograph or video on your social media channels. 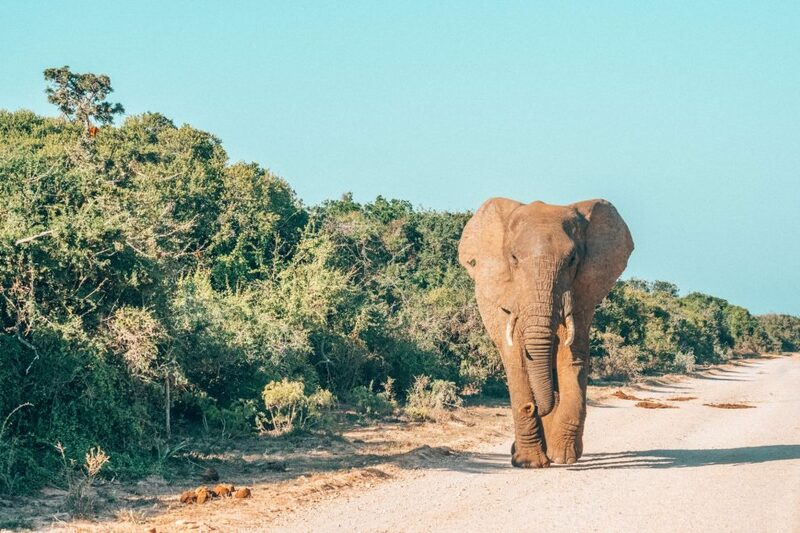 To enter write #AudleySafari and @AudleyTravel on your Instagram or Twitter post or share directly on the Audley Travel Facebook page here: https://www.facebook.com/audleytravel/. To find out more or enter via the website, visit https://www.audleytravel.com/social. Entries must be posted between 20th August – 23rd September.